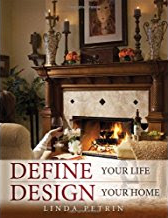 Founded by Linda Petrin, Lifestyle Design creates spaces that merge beauty and utility. Using her custom 7 Lifestyle Principles, Linda draws inspiration from nature, especially flowers and greenery. Whenever possible, her interiors meet exteriors and gardens. Growing up in an 1,100-square-foot home with nine brothers and sisters, space was tight. The spacious outdoors became my alternative home. My sister and I custom designed our imaginary childhood retreat under the canopy of a weeping willow tree. We made a garden and filled it with wild flowers found in the woods. Only those with the password were allowed into “Willow House,” and we would visit with our friends and eat lunch together under the great tree. In my twenties, I began to remodel and flip houses. Each house was a new experience. It seemed I was always on a journey to find a place to call home. If Dorothy on the “Wizard of Oz” could click her magic red heels together and call out “There is no place like home,” and magically find home, surely I could discover a place that felt like home for myself. But nothing seemed to fit. After flipping and building a few homes, as well as taking art and interior design courses, I merged into the design field and began a design career. I discovered I wasn’t the only one in search of “something more” from their home. It wasn’t just a well decorated home people wanted, but a deeper feeling of connection and contentment, centered on their home. I also observed the rare few who knew what they wanted the finished space to be. They simply needed professional advice and the right elements. These individuals had a home that was well put together, and their lifestyle ran smoothly. I wanted to know their secret not only for myself, but also for my clients. Today, I have made peace with my search for home, though life is always in flux, and though home changes to stay in tune with it. The outdoors is still a second home. Walking through the woods in the early morning with the birds just waking up, the soft breeze on my face blows across the lake and rustles the branches of the willow tree, or the colors of an early morning sunrise in the San Juan Islands: These are still my design inspirations. Perhaps the imaginary home under the weeping willow tree was not just my imagination after all. Former co-owner of “Fabrikations,” a softgoods (fabrics and accessories) and home interior shop. Designed the airport military lounge in Anchorage, Alaska for Capital Office Systems. Received two Presidential Citations from the Washington State chapter of ASID for my contribution to the society. Staged a mock up of the Alaska City Hall remodel for architects, influencing the final design.